In yachting, we are in the business of providing owners and charterers with fun and out-of-this-world experiences. But behind the scenes, we are all aware of the importance of safety and compliance relating to the operations of a yacht; as managers, captains and officers, we have a responsibility to make sure all those onboard are not at risk. The International Maritime Organization (IMO) and other regulatory bodies are continually updating regulations, which trickle down to superyacht operations and crew, and there’s little you can do but make sure you and your vessel comply. Globally, there are 1.4 million seafarers affected by the STCW refresher course introduction, and they are all vying for the same spots on the same courses. To make the situation even more challenging, there are relatively few training schools that have been approved by the MCA to teach the courses (see which ones have been approved or are pending approval HERE). Cruise ships and other commercial fleets have been block-booking classes for their crew at some training facilities, so it is becoming very difficult to get a spot. It’s best not to panic about the situation, but it’s important to make sure that your yacht is going to be prepared. The rules apply to both private and commercially operating superyachts, above 24m load line length. Whether your crew members will need to take responsibility for attending the course themselves or you will enroll them, time is running out, so it’s best to look into the situation as soon as possible. The new rules state that, come 1 January 2017, anyone who works at sea, is mentioned on the crew list and has safety related duties (which is almost every crew member) will need to have either completed their Basic STCW training after 1 January 2012 or will need to have completed the newly created refresher courses before the start of 2017. If your yacht is inspected by Port State Control (PSC) after 1 Jan 2017 and for all those named on the crew list you do not have onboard the original copies of your Basic STCW courses and the refresher courses, where applicable, then the yacht could be in serious trouble and prevented from operating. I.e., if you have a charter or owner trip starting the next day, you will not be allowed to take the guests until all the crew on the crew list are legally certified – Read: a very stressful situation you don’t want to find yourself in! Technically, if your yacht is out of the water at a refit yard come Jan 2017, you may buy yourself a couple of months on the certification front as long as it is high and dry, but there is still likely to be a significant backlog of crew looking to get certified at this point. And if you are still in the water and rules of safe manning apply (crew on watch, etc), then the new rules most certainly will apply. Most of the refresher courses cannot be taken remotely or on your yacht, with the exception of the Advanced Fire Fighting, which some schools are permitted to teach onboard (but not all). Class sizes are limited at each training school, based on staff and facilities size, so this is also going to limit how many crew can get through the courses before the deadline. There is only a handful of training schools that are able to offer the courses (see a table with information from MCA website HERE) and the number of places available is becoming increasingly limited. Many of the courses for the end of 2016 have already been booked up. On a personal level, if you do not have the relevant courses completed after 1 Jan 2017, you will not be able to work on a yacht and you will not be able to revalidate your certificate of compliance. The likelihood of postponement of implementation of the rules is very slim. It will not pay to delay action and hope the deadlines will be put back in the next 12 months. You took Basic STCW courses after 1 Jan 2012: You will need to take your refresher courses before five years has elapsed since you took the course, but have no rush for 1 Jan 2017. You took both Basic and Advanced STCW courses before 1 Jan 2012: You need to take both the Basic and Advanced refresher courses for safety at sea and fire fighting before 1 Jan 2017. You took Basic STCW courses before 1 Jan 2012, but advanced courses taken after 1 Jan 2012: You will only need to have the Basic courses refreshed before 2017, and the Advanced courses refreshed before five years has elapsed since you took them. 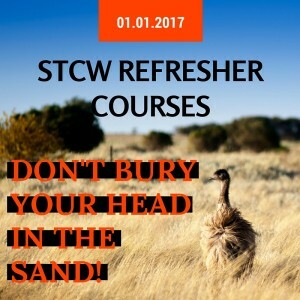 Be aware that if it’s not long until the Advanced courses are due to be refreshed, you may want to sync all these refreshers together to save on taking time off work and travel to get to the training schools; plus, going forward, you will be able to keep them to five-year cycles for refreshers. The STCW refresher courses are an unavoidable inevitability, and it’s important that every captain and first officer knows where their vessel is going to stand come January 2017. It looks as though PSC is going to be increasing its depth of inspections on certification as a result of these new regulations, too; so be sure that all your underlying certification is up to date and originals are kept onboard to prevent any nasty surprises. DOWNLOAD A LIST OF TRAINING SCHOOLS OFFERING THE STCW REFRESHER COURSES HERE. With thanks to Lars Lippuner of Warsash Superyacht Academy.